Homemaker Highlights: Friday freebie and recipe post. Friday freebie and recipe post. http://www.abcmouse.com/refer/24/712753202 FREE month of ABCmouse. You can use this link to sign up for a free month of ABC mouse. I recently signed Emma up to supplement our homeschool preschool we are doing. She loves the site! There are games, songs, printables, books, coloring pages, and so much more! She really loves that you receive tickets for every lesson completed and then you can redeem those for virtual items on the site. You can sign up three children to one account. Very easy to use and keep up with your children's progress. I actually have Lilly added in the Kindergarten section so she can play the games (even though she is in third grade. She still loves playing around on the site). It's 7.95 per month and the first month is free. You can sign up for one month and cancel after 30 days (you will not be charged). You do have to have a credit card to sign up for the free month. https://www.goodies.co Free goodie box. You do have to have a credit card, but I used a prepay and it went through. Use promo code IAfbP2 for the free box and shipping. Cancel before the month is out so they will not charge you 7.00 per month, unless you would like to keep the service. I used a prepay, so no worries on canceling. FREE Schick razor. You just text the word "SCHICK" to "24444". You will receive a text back and follow the link from there. Mine said to allow 6-8 weeks for delivery. http://www.puffsfreshfaces.com/free-sample-coupon/ FREE Sample of Puffs fresh faces and Boogie wipes. Per site "Everyone likes free stuff! By hitting us up with a “Like” on Facebook and joining our email newsletter, we will send you a FREE sample. You will also receive a $2.00 off coupon for any 45-count box of Puffs Fresh Faces because we know you won’t be able to live without them." http://www.goodnet.org/wristbands FREE Good doer wristband. It said to allow 40 business days. http://levelfoods.com/starter-kit-cvs/ FREE Level life glucose gel kit. This is great for diabetics! http://www.winsornewton.com/community/sample-request/ FREE *possible* Windor and Newton sample. Per site "From time to time Winsor & Newton may send out samples for interested artists. For your chance to receive samples, please complete the below request. Subject to availability. One sample per household." http://www.oxfordowl.co.uk/Library/Index/?AgeGroup=1 FREE online phonic books from Oxford owl. http://www.sunncelle.com/request-a-sample FREE 30 day supply of Sunn Celle. Per site "
International samples not available." Allow 2 weeks and an email will be sent when sample is mailed. http://us.moo.com/partner/sample/#2013 FREE business cards sample pack. You get 10 cards in the pack with free shipping and your details will be on the card. This is great for bloggers or Moms just wanting to exchange contact info. I've actually been approached in Walmart about my coupon binder and the couple was very interested in what I knew about coupons/freebies. I had a business card on me and it was great! I'm usually so scattered brained and forget paper/pens in my purse. Earlier this afternoon Emma Kay helped me with prepping our snacks for the rest of the week. 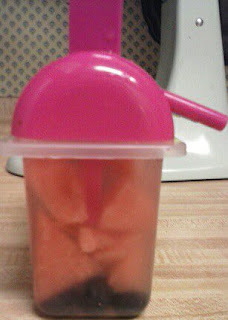 We decided to make some freezer pops while we were chopping. 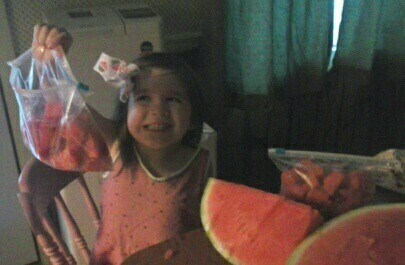 We just popped in some fresh watermelon, blueberries and a little water. The girls can't wait to try them tomorrow when they are jumping on the trampoline.